I was trying to think of a blog topic for today and I was thinking of the new national Stadium in Costa Rica which was an $88 million dollar project by the Chinese. I was driving by there yesterday and was informed that the Stadium seats 35,000 and only has 500 parking spots. "JESUS CHRIST! I'm walking on water!" This morning I was thinking about that and told a friend that squeezing all those cars in there will be similar to the way Jesus Christ fed all those people with such little bread. That is when my topic for today came to me. The JESUS CHRIST LIZARD happens to be one of the most interesting animals in Central America and I have nothing about it in this blog so it is long overdue to write about "The Basilisk" (Jesus Christ Lizard). For gosh sakes the thing walks on water!!! Probably the best name I've heard given to the Basilisk besides Jesus Christ Lizard is "miniature dinosaurs". When you look at them it really does look as if you are looking at a dinosaur. It is the male species that looks the most like the dinosaur with it's large crest on head and back tail. The lizard can reach almost 1 meter long which is just over 3ft. This is a species that enjoys being in warmer weather at lowlands. You will hardly ever see one above 1000m (3,000ft). Now everyone knows that they are called the Jesus Christ Lizard because this is the species that can actually walk on water. The question is are they really holy lizards sent by Jesus Christ or is there some other reason for this. Depending who you talk to most will say there is some other reason and I think I will go with that also. 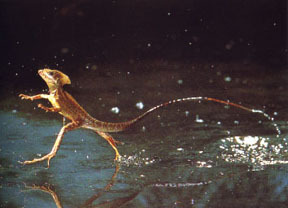 The secret of walking on water for these lizards is that they have very large hind feet with flaps of skin along each toe. This is different than webbed feet. Along with these flaps of skin they move very quickly. The smaller Basilisk (Juveniles) can walk up to 10 or 20 meters across water while the larger (Adult) Basilisk can still do it but look as if they are struggling a little more than the youngsters. Sort of like a bunch of 55 year olds playing pick up basketball. There are four different types of Species of Basilisk. The oldest reported Basilisk can live up to 7 years. Interested in Learning How to Walk on Water?